from How to Roast a Lamb, pp. 212-213. Back in the old days, Greek women had arms like lumberjacks. Or so I gather. Michael Psilakis’s new book reminds me of how hard it is to make thin phyllo dough by hand, how much muscle you need to make a Greek béchamel. You needed a lot more brawn than the homemade pasta and the labor intensive polenta Italian women used to make from scratch. I am blessed with five Greek brothers-in-law and nephews. My late sister married a Greek and I was married to a Greek. One of my Greek former brothers-in-law is in the country. We had not seen each other since my 50th birthday party in Paris five years ago. After a camping trip to Yosemite with his partner, they drove north to have dinner at my house. Call me foolish, but I decided to make a traditional Greek dish. 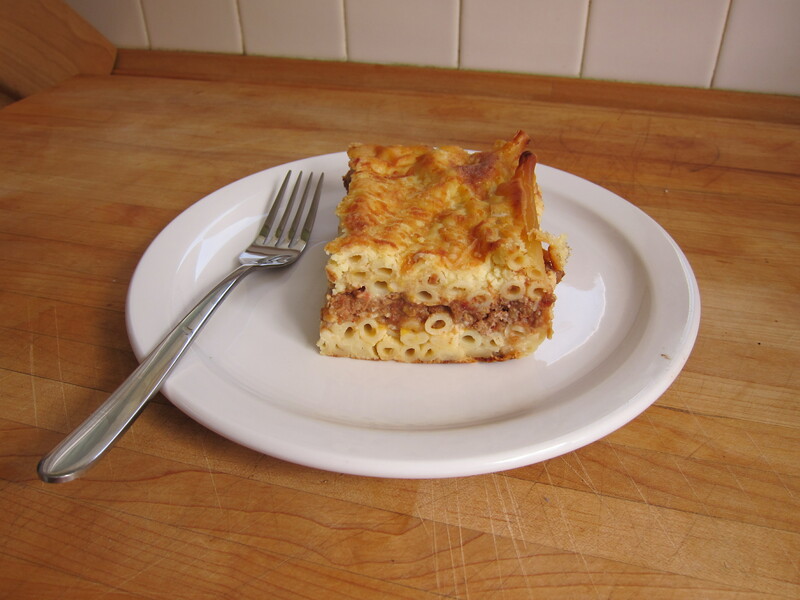 Pastitsio is to Greek cooking what lasagna is to Italian and steak-and-kidney pie is to British cooking. It’s in the stodgy category. When done well, it still sits like a lump in your stomach. Nevertheless, I decided to give the Psilakis version a try. I have made only one other recipe from the book. His spanakopita is a little too creative. I fed it to a crowd of people who adored the flavors, but I felt it looked like a mess. This recipe worked very well. The béchamel custard set properly. I worried that it would make it gooey, but that was not a problem in the least. The cinnamon-nutmeg flavors in the meat sauce worked beautifully with the custard. Pastitsio could almost be a dessert — but not quite. As for ingredients, thanks to Mediterranean Market here, I found everything I needed, from the Misko Macaroni to the Cretan graviera cheese. If you haven’t investigated the Mediterranean/Middle Eastern groceries in your area, here’s a reason to do so. Start hunting. If you have time, make the meat sauce the day before. In a large, heavy pot, melt the butter over low heat, whisking with a large balloon whisk. Add the flour and whisk to a very crumbly roux, not a smooth paste. Shadowcook: Think of pie dough before you add the water. Whisk constantly and energetically for about 5 minutes to cook off the raw flour taste, but do not allow to brown (slide the pot off and on the heat every now and then if you sense it is getting too hot). Shadowcook: By the time you incorporate all the flour, you will start thinking about switching to a wooden spoon. Hold on as long as you can with the whisk. It’s a pain, but keep clearing the middle of the whisk wires of dough that’s stuck there. I found tapping it on the bottom of the pan worked. Still whisking constantly, drizzle in the warm milk until smooth. Shadowcook: That is very important. Do not rush incorporating the milk into the roux. If you try to whisk in too much at once, the sauce will be lumpy. At this point, your arm is going to feel the strain, because unlike other béchamel recipes, this one starts out thick as concrete and winds up still thick but thin enough to stir without cramping your arm. Just be patient. Continue cooking, adjusting the heat as necessary to keep the mixture at a very low simmer, until very thick. Shadowcook: Ha. Right now you’ll be thinking, is he crazy? Does he pump iron? Whisk in the cinnamon, nutmeg, kosher salt to taste, and a generous amount of pepper. Shadowcook: This is the moment to get the seasoning right. Taste it. And don’t undersalt it. Shadowcook: Tempering the eggs is a good trick to learn. It’s a great way to incorporate egg yolk into hot liquids without the yolks forming bits. Avgolemono soup (Egg Lemon Soup), a divinely delicious soup, is made velvety through this technique. Eggs are needed here to make the custard consistency. Shadowcook: If you can’t find the Misko Macaroni, try using perciatelli or bucatini, any long pasta with a hole in the middle. If you can’t find graviera, use Pecorino Romano. Make the kima sauce: in a large, heavy pot over medium-high heat, add the oil and wilt the onion with the bay leaves and cinnamon sticks for 3 to 5 minutes. Add the ground beef and brown thoroughly. Add all the spices and the tomato paste and stir for 1 to 2 minutes. Add the water, tomatoes, vinegar, sugar, about 2 tablespoons of kosher salt, and a generous grinding of pepper. Bring to a boil. Shadowcook: I made the kima the day before. It saved a lot of time and distributed the work more efficiently over two days. Reduce the heat, partially cover, and simmer for 65 to 75 minutes. Skim off the fat once or twice. Shadowcook: If you make it the day before, scraping off the fat is easy. Reduce until the sauce is almost completely dry. Proceed with the recipe, or cool and refrigerate. Preheat the oven to 350. In a large pot of generously salted boiling water, cook the macaroni until almost tender, a minute or so before the al dente stage. Drain well. Spread 1 cup of the Greek Béchamel Sauce [above] on the bottom of a deep roasting pan or lasagna pan [or 13×9 pyrex dish], and sprinkle with 1/3 cup graviera. Lay half the noodles out on top of the bechamel. You should have 2 to 3 layers of noodles. Spread another cup of the béchamel over the noodles, without disturbing the direction of the noodles, to bind them. Scatter with 1/3 cup of the graviera. Spoon all of the kima sauce over the top and smooth flat. Spread 1 more cup of the béchamel over the kima sauce, scatter with 1/3 cup graviera. 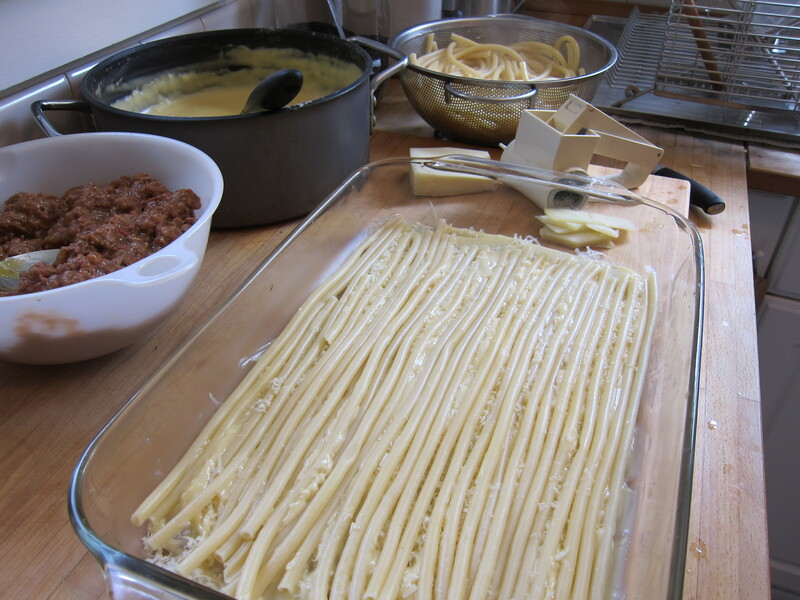 Layer remaining pasta noodles over the béchamel. Spoon on the remaining béchamel and scatter with the remaining 1/3 cup of graviera. Bake uncovered until crusty, golden, about set, about 1 hour. If you don’t have a convection oven, you may want to increase the heat to 400 F at the end, to brown the top. Shadowcook: I increased the heat to 400 F and you see the result. Cool for at least 40 minutes, to allow the custard to set so that the squares will remain intact when you cut them. Or, cool to room temperature, then refrigerate overnight. Michael, Thanks so much for the recipe. 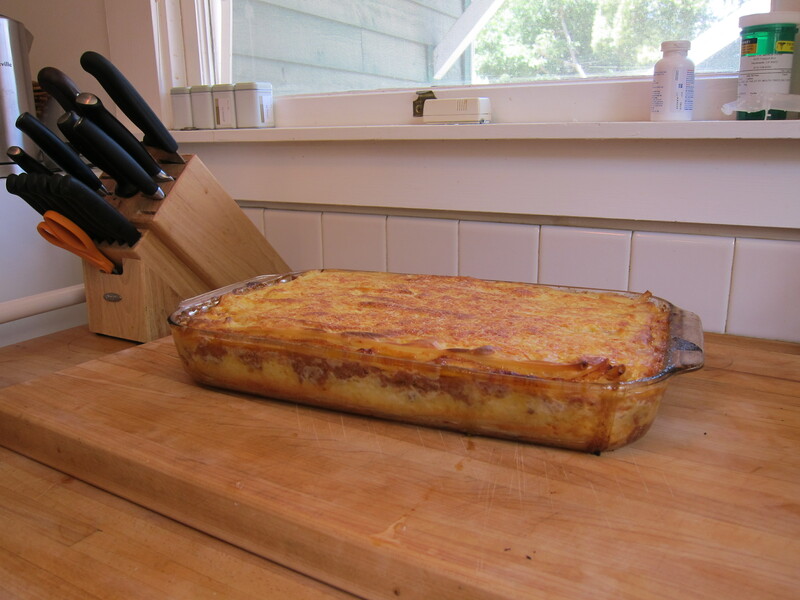 It was by far the best Pastitsio I’ve ever made. As an italian girl, in love with Greek food, I have tried to perfect my recipe over the years. My family said I nailed it! I just finished making 3 large trays for Christmas Eve dinner (by popular demand). I would like to say that I’ll share the credit with you, but I won’t (haha). Thanks again!